"The Sandtown Community is one of the oldest communities in Fulton County, Georgia and is located within 15 minutes from the airport and downtown Atlanta." 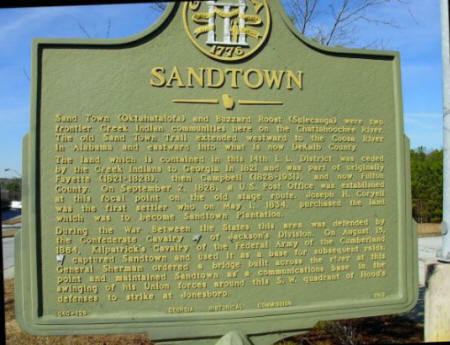 Sandtown has the official county designation as the Sandtown Overlay District. 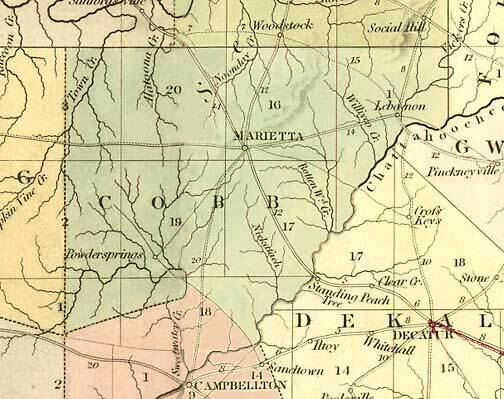 The Board of Commissioners of Fulton County, Georgia established the Sandtown Overlay as part of a strategy designed for the purpose, among others, of promoting the health, safety, order, prosperity and general welfare of the citizens of Fulton County through the regulation of design, aesthetics, location, bulk, size of buildings and structures, and the density and distribution of population. "Map of Georgia & Alabama exhibiting the post offices, post roads, canals, rail roads & c. By David H. Burr. (Late topographer to the Post Office.) Geographer to the House of Representatives of the U.S." From his The American Atlas (London, J. Arrowsmith, 1839).